Geoff graduated from Georgetown University in 1995 with a degree in theology. He then went on to graduate first in his class at the Culinary Institute of America in Hyde Park, NY. Geoff opened Chef Geoff’s in 2000 and Chef Geoff’s Downtown in 2002. Both were opened before he reached the age of 30. 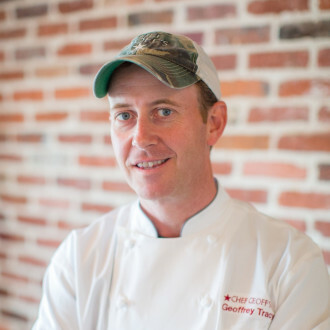 In 2006 Geoff opened his third restaurant, LIA’S in Chevy Chase, MD. In late 2008 Geoff opened Hank’s Tavern & Eats in Hyattsville, MD. He operates the 200 seat restaurant in partnership with his brother Chris Tracy. Geoff’s fifth restaurant, Chef Geoff’s Tysons Corner opened in 2009 in Vienna, VA. The sixth restaurant, Chef Geoff’s Rockville, opened in 2012. Geoff, along with a very talented team, oversees restaurant operations as well as managing the concept, menu development, marketing, finances, and growth at each of the restaurants. The restaurants serve 750,000 guests every year and employ more than 400 amazing people. Geoff is also the co-author of the New York Times Best Seller, Baby Love. Baby Love teaches busy parents how to feed “Healthy, Easy, Delicious Meals for Your Baby and Toddler”. The book is published by St. Martin’s Press. As an active member of the Washington DC community, Geoff serves as vice chairman on the executive board of the Restaurant Association of Metropolitan Washington. Additionally, Geoff contributes to more than 150 charities and organization every year in the form of silent auctions, fundraising appearances, and even the Chef Geoff sponsored Little League team. Geoff is also a member of the Washington Baltimore chapter of the Young Presidents Organization. Geoff is extraordinarily fortunate to be married to the love of his life and CBS This Morning Anchor Norah O’Donnell. They reside in both New York City and Washington DC with their three beautiful children Grace, Henry, and Riley.